Rosewood Naturals Carrot and Fennel Sticks are deliciously natural treat sticks, bursting with healthy ingredients. Free from cereals and other unnecessary bulking ingredients; they are enriched with healthy vegetables, seeds and herbs. 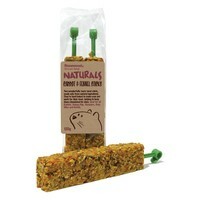 These yummy sticks are baked to perfection, offering small animals a wholesome snack they can enjoy nibbling away at. Not only do these Carrot and Fennel Sticks taste great but they offer your pet vital stimulation to deter boredom.